When we can’t have children, and our friends can and do, our friendships face a precarious balancing act, needing sensitivity to a new mother’s single-minded focus on her children as well as sensitivity to the pain of a potential mother who has lost the future she’d hoped for. Even with the best of intentions, one or both partners in the friendship may slip and fall, and the friendship suffers damage. As difficult as it can be when our friends are having children and we’re not, when we can feel cast aside and ignored, this time passes before we know it. Children don’t stay young forever, and our old friends eventually realise that their lives are actually not much different from ours. A friend made that point to me - not to ignore what she has and I don’t, but to point out that the years of active parenting are relatively short, and that for the bulk of our relationship (ie the next 30 years or so) we will both be living no kidding lives at the same time. Her children have now left home, and we can and do get together pretty much whenever we like, as the only things that get in the way now are work commitments, and caring for elderly parents. 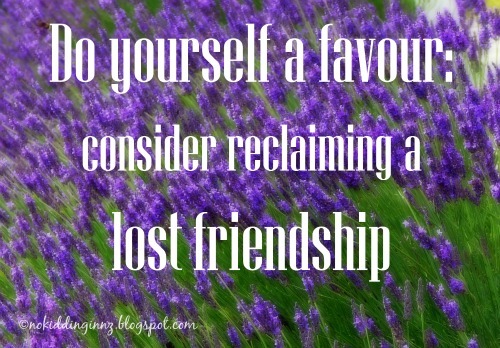 Whilst we can hold onto those friendships that sustained us in our times of need, it is also possible to reclaim those old friendships - if they aren’t irretrievably damaged by harsh words and hurt feelings on either side - too. As we rekindle these relationships, I like to think that they will be more sensitive, kinder and wiser, and a part of our lives for many more years to come. Note: Klara, who is reclaiming a friendship as her friend's children grow, inspired this post. Note 2: The lavender photo is from a weekend staying at my above-mentioned friend's house. I love this post, as I really struggle with friendships. I have tried SO HARD to keep my friend who don't have kids (all by choice, as far as I know), but it's hard. A lot of them seem less able to find the time than I am! I hope that some day I can reclaim those friendships. Some day. I adore the lavender photo.... I just love lavender. I struggle with friendships too. Part of it is that as an adult I've moved around good bit (three different states since I graduated from college at 22) and my friends have done the same, so there is distance and time zones to contend with. The rest of it is my age, meaning that most of my friends are going to be actively parenting for the next 10-15 years. But this is a good reminder that the pendulum may start to swing in the other direction at some point. I love the idea that a paused friendship can always come back when the time is right. So true that in order to do so you have to have been sensitive with one another and not burnt the bridge. It may seem odd, but I feel that most of my friendship with those I knew before I was parenting are more valuable than most of those I've made solely because I am parenting. These friends have been with me through some gnarly stuff and because they see me more than just a caregiver. Too often, people push friendships to the wayside when one half isn't meeting similar life-goals. Yet it's so sad because those friendships are often lamented when they pass, especially when they often don't need to with a bit of care. I love the idea of "reclaiming" a friendship. There's something empowering about casting it in those terms. I agree with Cristy that my most valuable friends aren't the ones who see me as a parent, but who see me as a whole person. Loving this idea, though I try to balance it out by saying that if it happens, it happens, but I won't have too high expectations anymore (because it has backfired on me). This has begun to happen to me. It's really lovely, and I wish that I had read this post five years ago when it felt like all my friends had set sail to the island of children leaving me crying on the shore.